Cody spends a cold, dark evening with an independent horror movie that can be viewed on Vimeo. The feature debut of writer/director Christina Raia, Summit isn't quite the horror movie you're expecting it to be. 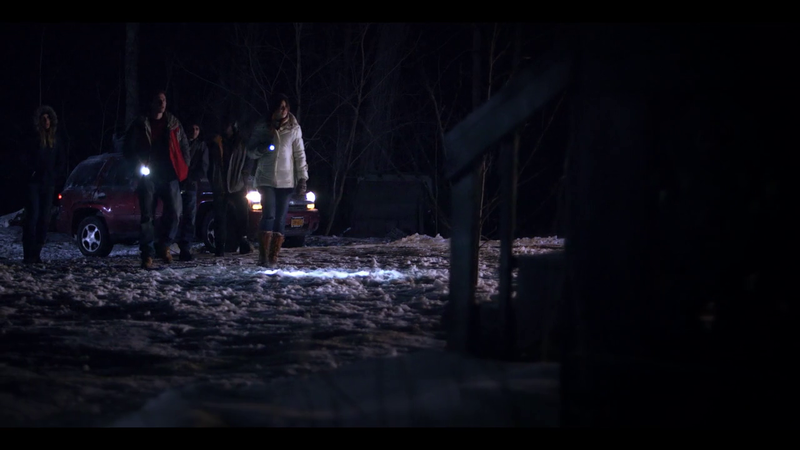 It starts off in a very familiar manner, with five young people on their way to a vacation destination, in this case a ski resort. This is a set-up the horror genre has been working with for decades, although there is a modern twist to it: the group is taken off course by bad information given to them by their GPS. Following the directions this little device attached to the windshield gives them, they end up not at a ski resort, but at an abandoned house deep in a snowy wilderness. The group is forced to settle in at the abandoned house for the night, and you know where this going, don't you? Someone's going to start picking them off one-by-one... But that's not what happens. It is true that they're not all going to get out of this scenario alive, but things don't play out in the way the genre has conditioned you to think they will. For some, Summit may be a breath of fresh air. For others, it could be a frustrating viewing experience. Raia was pulling inspiration from some great sources when she was putting Summit together, like The Twilight Zone, the works of Alfred Hitchcock, and a pair of John Carpenter classics, Halloween and The Thing. The Halloween influence is mainly seen in the cinematography by John L. Murphy, which is quite impressive, especially when you take into account that this film was made on a budget of just $20,000 (over $12,000 of which was raised on Kickstarter.) 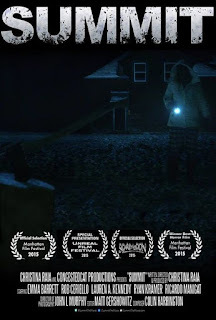 Shooting at night can be tricky for low budget movies, but there are long stretches of Summit that are set at night and Murphy handled them expertly, employing some Halloween-esque blue gels while doing so. The influence that shines through the most, though, is that of The Thing. It isn't some masked slasher that tears apart Raia's group of characters, it's the situation they're in, the remote location they're trapped at, the paranoia that builds among them and the in-fighting that flares up. As you might imagine, it takes quite a while for characters that start off thinking they're in for some good times to reach the point of total breakdown, so if you're not prepared to go on that particular psychological ride, you might start getting antsy waiting for something, anything to happen. The slasher bait and switch was intentional, Raia wanted to use the cliché set-up as a way into a character study, and she does delve deeply into the group of characters that she tossed into this snowy hell. There's Lauren A. Kennedy and Rob Ceriello as Jesse and Sean, the couple with a rocky relationship; Ryan Kramer as Will, Sean's friend who has a crush on Jesse; Ricardo Manigat as Sean's friend James, who wasn't happy that Sean invited Jesse along on what was supposed to a just-the-guys getaway; and Emma Barrett as tourist Sarah, who decided to tag along with the group and makes James feel better about the fact that this isn't just a guys-only trip anymore. We get to learn the ins and outs of how all of them relate to each other, how much they get along or don't. For this type of movie, the actors have to carry things entirely, there's no getting by with some cool kills or a thrilling chase sequence, if there were poor performances here the entire thing would crumble, but thankfully the actors all do fantastic work here. I will say that Ryan Kramer has sort of an unusual screen presence, he comes off as so low-key and soft-spoken, kind of awkward, but it worked for me, I found Will to be the most likeable of the bunch. Honestly, Summit didn't entirely work for me because I wanted it to be at least a little more typical. There were times when I started to get tired of the character study approach. Times when I wanted the characters to stop talking about their lives, feeling anxious for some action and thrills to kick in. Times when it was a struggle for me to keep my attention on what was happening on the screen. The movie felt longer than its 79 minutes to me. The slow burn pace burned a little too slowly for my liking, but beyond that personal preference there is very little I could knock Summit for. I respect what Raia was doing with it, the acting is great, and so is the cinematography. It's a very well made indie, and definitely worth checking out to see how its unique divergence from expectations works for you. 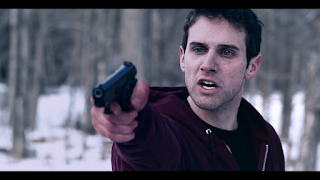 Summit is available to be rented or purchased on Vimeo On Demand. lemme guess: this is going to be something like "I Didn't Come Here to Die (2010)"? I haven't seen that one, but it sounds like they do something different from what happens here.